Why can't employers find enough candidates to hire? The September jobs report will be released tomorrow — the next to last report before Election Day. 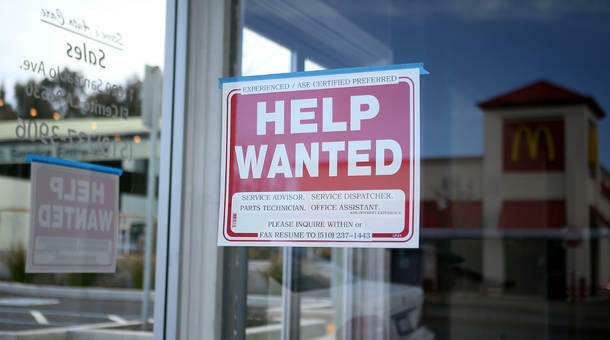 As the job market strengthens, many employers are saying they can't find enough workers. Is this good or bad? Chris Farrell, a senior economics contributor for Marketplace, joined us to chat about the country's labor market. This is the greatest opportunity for us to seize. I mean, if you think about it, the major economic imbalance of our time — and it's fueling a lot of the anger that seems to be out there that's come out during this election — is a lack of inclusion in the work world. Whenever I hear these complaints about businesses saying, 'Ah, you know, we can't find workers, we need to be finding more workers,' all I can think about is this is a tremendous opportunity to seize to attach people to the mainstream job market. I think there hasn't been enough focus on it. I love Nobel Laureate Edmund Phelps, and he's been proposing year after year about low-wage employment subsidies, like a matching grant. So if a company hires low-wage workers, they get a matching grant. And then of course, we need to put a lot more resources into training and re-training programs. So if we make a concerted effort to take advantage of the current environment that we're in, David, with programs like this, I think it's going to make a real difference to people. I've talked to a lot of community colleges. And you call them up because they had this wonderful training program, and it really worked. And then you say, 'Well, how's it going?' And they go, 'Well, we ran out of funding.' ...What we need is more resources put into training with employers, community colleges, nonprofit organizations and government, and to say, 'Look, we're gonna have to invest in people and we may have to reinvest in people as time goes on.' But this is a way of keeping people prepared for the labor market and the opportunities that are out there.